Greetings and salutations my fellow readers. It’s been a bit of a roller coaster ride publishing the last two posts on GMOs, so I thought to myself, where should I go next? Dive further into the rabbit hole (making myself ever more unpopular), or switch topics? I have an interview with a scientist, check! With a farmer, check! Biotech firm? Bingo! An opportunity thus presented itself, so down I went further down the rabbit hole. 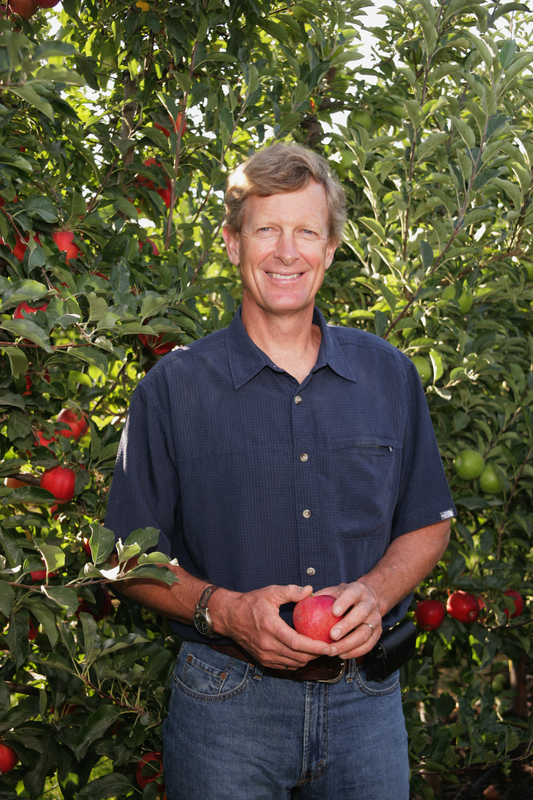 So, to round out—and conclude—my trifecta (or triumvirate—a much cooler word that makes me sound smarter than I am) of posts about GMO, I have just finished up an email Q&A with the CEO and founder of Okanagan Specialty Fruits (OSF), Neal Carter, whose company makes Arctic Apples (apples that don’t brown). In my two previous Q&As— with a scientist here and with a family farmer here—I had commentary and concluding thoughts; this time, I prefer to let their positions stand on its own two feet, as it is more than capable of. Do note, however. I am not trying to convince anyone to not eat organic food, or to eat GMO food, so don’t get your knickers in a twist. 1) What prompted your company to create a GM nonbrowning apple? Why not, for example, try to do the same with hybridization? Our motivation for developing biotech apples, and all our other projects under development, is to introduce value-added traits that will benefit the tree-fruit industry. We have chosen to focus specifically on nonbrowning Arctic® apples as our flagship project for a number of reasons. One of the chief ones is that apple consumption has been flat-to-declining for the past two decades and we are confident the nonbrowning apple trait can create a consumption trigger while also reducing food waste throughout the supply chain. Another key motivation is ever-increasing demand for convenience. Arctic apples are ideally suited for the freshcut market, which is expensive to enter because of the browning issue. We often refer to the consumption trigger that convenient “baby” carrots created – they now make up 2/3rds of all U.S. carrot sales! As for why we use biotechnology to achieve this, it’s because we knew we could make a comparatively minor change safely, relatively quickly, and precisely. We silence only four genes, specifically, the ones that produce polyphenol oxidase, which is the enzyme that drives the browning process. We do so primarily through the use of other apple genes, and no new proteins are created. If we were to attempt to breed this trait conventionally, we could easily spend decades trying with no guarantee of success. 2) What benefits will the Arctic apple bring to the food market? Are there quantitative studies that can predict how effective it could be? In addition to addressing stagnant apple consumption and tapping into the underutilized freshcut and foodservice markets, Arctic apples offer plenty of other benefits throughout the supply chain. For growers and packers, nonbrowning apples can help significantly reduce the huge number of apples that never make it to market because of minor superficial marks such as finger bruising and bin rubs. So much of the food produced today is wasted purely for cosmetic reasons. This extends to retail where the nonbrowning trait can have a big impact on shrinkage and making displays more attractive while also offering exciting new value-added apple products. Consumers will also benefit from throwing away far less fruit at home – how many apples get bruised up on the way back from the grocery store or in kids’ lunchboxes? Our goal is helping consumers, especially kids, eat healthier and waste less food. Last year, one grade 2 teacher wrote about how excited she is for nonbrowning apples, explaining she sees countless perfectly good apples and apple slices thrown out by her students due to minor browning and bruising. Consumers will also enjoy other tangible benefits like new opportunities for cut apples in many cooking applications. As for quantifiable evidence showing the value of these benefits, food waste has been a major issue over the past year with recent estimates from the UN’s Food and Agriculture Organization suggesting around one-third of food produced is wasted. The numbers are even worse for fruit, where around half of what’s produced never ends up getting eaten. As far as the potential to create a consumption trigger, the produce industry is full of examples of how making fruit more convenient, especially for the foodservice industry, results in huge consumption boosts. We mentioned how baby carrots now make up two-thirds of carrot sales and reports tracking major fruit and vegetable consumption trends frequently emphasize convenience. One example explains one of the most prominent, ongoing trends “is a consumer demand for foods of high and predictable quality that offer convenience and variety.” Arctic apples satisfy all these requirements. For apples, specifically, there’s lots of attention given to how various chemical treatments can slow browning and plenty of attempts to conventionally breed low browning varieties (though this is quite different from being truly nonbrowning). For instance, a notable 2009 publication from the Journal of Food Engineering discusses how “the market for fresh-cut apples is projected to continue to grow as consumers demand fresh, convenient and nutritious snacks”. Yet it also explains that the “industry is still hampered by-product quality deterioration” because when “the cut surface turns brown; it reduces not only the visual quality but also results in undesirable changes in flavour and loss of nutrients, due to enzymatic browning.” Again, Arctic apples address these issues. Finally, some of the most convincing evidence that the nonbrowning traits will provide substantial value – both apple producers and consumers have told us so! In 2006/07 we surveyed a number of apple industry executives, 76% of whom told us they were interested in Arctic apples. In focus groups, we have found that over 80% are positively interested in Arctic apples and 100% of participants wanted to try them. Even more encouraging, when we surveyed 1,000 self identified apple eaters in 2011, we found that their likelihood to buy Arctic apples continued to increase the more they learned about the science behind them! So Arctic apples, our very first project, still haven’t been commercialized 17 years after we were founded and over a decade after we proved the technology and planted them! That means we now have over ten years of real-world evidence that Arctic trees grow, respond to pest and disease pressure, flower, and fruit just as conventional trees do. Over this time, our apples have likely become one of the most tested fruits in existence. This makes detailing all of the specific tests impossible here, but we encourage anyone interested to view our extensive, 163-page petition on the USDA’s website, which provides full details. These tests were performed by a variety of reputable groups and individuals, some third-party, some in-house. Our field trials were monitored and data was collected by independent horticultural consultants and an Integrated Pest Management specialist. Of particular importance is the fact that there are no proteins in Arctic fruit that aren’t in all apples. This shows there’s nothing “new” in our apples that will affect consumers. This is expected as we silence the genes that cause browning, rather than introduce new attributes. To give an idea of how sophisticated the tests used to prove this are, they would be able to detect a single penny amongst 100-250 ton coal-sized rail cars! 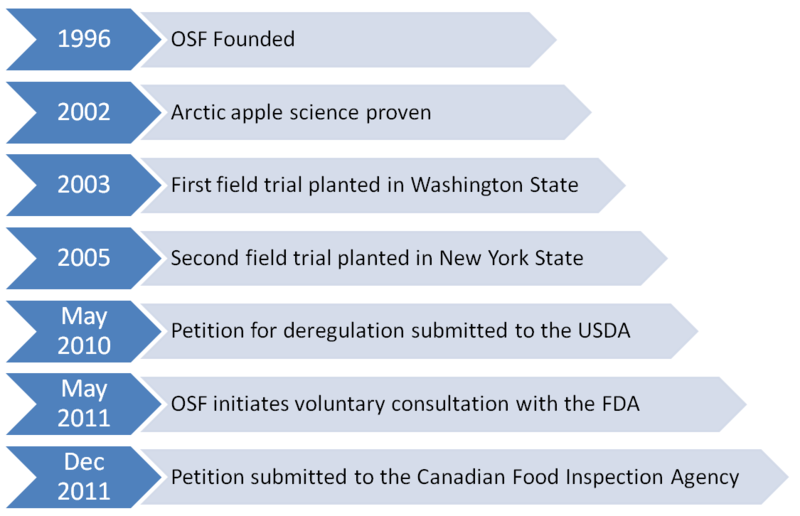 We are confident Arctic apples are safe, and soon, we anticipate FDA’s confirmation of this. So what has all of this extensive testing taught us? Exactly what we thought it would – Arctic trees and fruits are just the same as their conventional counterparts until you bite, slice or bruise the fruit! 4) Can you name a few of the misconceptions — if any — that people associate your company with, or accuse your company of, when they find out you’re a biotech company? If there are misconceptions, why are they wrong or miss the big picture? Absolutely – just as there are countless misconceptions about biotech foods in general, there are also plenty of myths about our company and Arctic apples. In fact, one of our most popular blog posts ever is titled “Addressing common misconceptions of Arctic orchards and fruit”. Arctic apples will cross-pollinate with other orchards, causing organic orchards to lose organic certification: No organic crop has ever been decertified from inadvertent pollen gene flow. Even if pollen from an Arctic flower did pollinate an organic or conventional fruit, the resulting fruit is the same as the mother flower….not that of the pollen donor. Additionally, we are implementing numerous stewardship standards to ensure cross-pollination won’t occur, including buffer rows, bee-hive placement, and restricting distance from other orchards. Because Arctic apples don’t brown, they will disguise old/damaged fruit: The opposite is true! Arctic apples won’t experience enzymatic browning (which occurs when even slightly damaged cells are exposed to air), but the decomposition that comes from fungi, bacteria and/or rotting will be just the same as conventional apples. This means that you will not see superficial damage, but you will see a change in appearance when the true quality is impacted. Other accusations we hear somewhat frequently from a vocal minority who oppose all biotech foods are “we don’t know what the effects will be down the road” or that we’re “messing with God/Mother Nature”. Regarding the first claim, the science tools we now have are truly amazing and we have an unprecedented level of precision, control and analysis when developing biotech crops. They must be meticulously reviewed before approval and around three trillion meals with biotech ingredients have now been consumed without incident. As to the messing with God/nature charges, biotech-enhanced crops are really just one more advancement in a long history of human-driven food improvements – and even the Amish and the Vatican support these advances! 5) As an insider, you are privy to the goings-on and workings of the biotech industry, what do you envision the future of biotech to be? What new seeds are coming down the line and what potential advantages or disadvantages might they bring? We foresee biotech continuing to be the most rapidly adopted crop technology ever, as it has been for the past 17 years. We also anticipate already realized benefits from biotech crops to continue, such as those highlighted by a fifteen year study including increased net earnings of $78.4 billion for farmers (mostly from developing nations), a reduction of 438 million kg of pesticide spraying and the equivalent reduction in greenhouse gas emissions as removing 8.6 million cars from the road for a year. Two major categories in particular where we’ll see further advancements are in environmental sustainability (reduced pesticide use, carbon emissions, food waste) and higher crop yields under adverse conditions (from pest resistance, drought-tolerance, etc.). Another major trend you’ll see is the increased presence of biotech foods with direct consumer benefits, particularly nutrition. We will see many new projects following in the footsteps of crops like Golden Rice, which is fortified with beta-carotene; a precursor to Vitamin A. The World Health Organization has identified that around 250 million children under the age of 5 are affected by Vitamin A deficiency, which can cause blindness and death. Biotech crops like Golden rice can potentially save millions of lives by helping address this, and efforts are already underway to produce other Vitamin A enhanced crops including bananas and cassava. This is just the tip of the iceberg, though, as there are many other exciting developments on the way including many other nutrient-enhancements for cassava, numerous drought-resistant crops, blight-resistant potatoes and many more. I actually highlighted some of these crops in a TEDx talk I gave in October 2012 on the value of agricultural biotechnology, which is available to watch online. 6) As a biotech company, do you bear the brunt of the anti-GMO backlash nominally directed at Monsanto and DuPont? If so, how has this affected you? Please be specific. All companies who develop biotech crops have to deal with a certain level of backlash from the vocal, emotional minority who oppose biotechnology. We are quite unique because when consumers discuss biotech companies, names like Monsanto and DuPont, as you mention, are the first ones that come to mind, rarely small companies like ours. Using Monsanto as an example, they have approximately 22,000 employees – we have 7. Because most organizations in this industry are pretty massive, they do get the lion’s share of attention. That being said, if we were to create a ratio of media attention to company size; ours would be through the roof! One key reason we likely get more than our fair share of attention is that we’re dealing with apples. When we’re talking about something as popular and iconic as the apple (e.g., “an apple a day”, “American as apple pie”), it’s going to get people emotionally charged. Genetically, our enhancement is relatively minor compared to the majority of crops out there; yet even so, when our petition was available for public comment along with 9 other biotech crops in the U.S., we received around three times as many comments as all 9 of the other petitions combined! In terms of how all this attention affects us, we can dictate that to some extent. On one hand, we could simply choose to ignore it. The review process is evidence-based (and rightfully so! ), meaning we could keep our heads down and let the science speak for itself and not worry about what people are saying. That’s not how we operate, however, as we believe in the benefits and safety far too much to keep quiet. We want to do our best to make sure accurate, evidence-based information is out there to counter-balance all the myths and misinformation. This may mean that we spend more time and resources on education than others might, but it’s too important of an issue not to. We believe everyone in the science and agricultural industries have a responsibility to help educate the public on the facts of biotechnology. Sometimes that results in more backlash, but it’s worth it. 7) Some scientists state that the anti-GMO backlash has cemented Monsanto’s grip upon the market because only they can afford the regulatory burden, do you find this to be true in your experience? And how does this affect the greater biotechnology field? Well, we’ve touched on how rigorous the review process is and how much smaller we are than the big industry players, so yes, it is tough for smaller companies to bring a biotech crop to market. It’s challenging to raise funds, produce needed data, spend the resources providing education, and it’s just a much bigger overall risk. While the regulatory burden is heavier for small biotech companies, I think we’re an example that it’s still possible for the little guys to make it through, but it’s not easy. Not only do you have to successfully develop a fantastic product, but you must be focused, persistent and very patient. There is no rushing the review process, but here we are a decade after first planting Arctic trees and we expect to achieve deregulation in the U.S. later this year. Even though we’re helping demonstrate it’s possible for small companies to commercialize a biotech crop, the high regulatory burden certainly does affect the industry as a whole. With such an intimidating outlook in terms of high investment, both in time and resources, there will obviously be far less small, entrepreneurial companies than would be ideal. In a field in which innovation should be embraced as much as possible, we are missing out on many potential innovative companies and value-added products because the barriers are so high. Really, what it comes down to is the regulatory process is (and should be) extremely rigorous, but it is indeed possible for companies that aren’t multinationals to accomplish commercialization. Ideally, once biotech crops add further to their exemplary track record of safety and benefits and the scientific tools continue to improve; these barriers will gradually be lessened. 8) Lastly, what is your relationship to the government and governmental agencies. It has been alleged that agencies like the FDA are in the pocket of big biotech organizations and are willing to look the other way. Do you find any truth in those statements? If not, why not? If we had to select one word to describe the multiple regulatory bodies we’ve dealt with over the past few years (USDA, APHIS, FDA, CFIA) it would be “thorough”. There’s certainly no looking the other way and nothing casual about the review process. If these government agencies were in the pocket of biotech companies, we wouldn’t still be awaiting deregulation more than ten years after we first developed Arctic apples! Some people will see that some of the agencies have former members of biotech companies and immediately distrust the whole system; this misses the point. Of course they will have some former industry employees. These companies have thousands and thousands of employees and plenty of them are well-credentialed with first-hand experience in multiple facets of agriculture. In most fields, movement between private and public spheres is common, and most working aged citizens will have at least 10 different jobs before they turn 50. Some overlap is inevitable. The truth is, you will hear a very wide range of arguments from those who don’t like biotech crops and this is just another one on that list. Luckily, there is more than enough evidence to show that biotech crops are indeed safe and beneficial, including over 600 peer-reviewed studies, around one-third of which are independently funded. The best advice we can give to consumers is to do their own research, but always with a close eye on the credentials and reputability of the sources! Neal Carter is the CEO and founder of OSF. Thank you for your time Neal. I am, well, me; a curious fellow trying to make sense of the world (and I just released the 2nd edition of Random Rationality: A Rational Guide to an Irrational World for Kindle). It’s working out so far, and quite fun too. So, would you eat an Arctic Apple? Another terrific item in this series. This is such a great example of how it’s not all one monolithic big company with this technology, and that it’s not all about selling chemicals. That’s probably the biggest problem in any discussions on this topic. Everyone’s head is full of that fog and they can’t even imagine that a small company, academics, farmers, and governments in the developing world might want to make improved crops that have nothing to do with big ag and/or chemical sprays. I think this is a very insightful post. However, my biggest complaint about it is that it happens to be a fruit crop (he acknowledges that you are dealing with smaller gene pools). The backlash toward GMO’s tends to be more heavily located in the corn and soybean juggernauts, and other crops. Most of the people are unaware that things like apples, and fruits can be genetically modified. If the industry had focused on these first, (and the things like Golden Rice), they may have been more widely accepted. However, I heard a story a few years back on how people would rather not purchase the golden rice because of the strange color? All our food has been genetically modified, I mean, I had purple potatoes in soup this weekend. That being said, I am thrilled that you got representation from a small company. And great 2nd last point, everything we eat, organic or not, has been genetically modified over the last 12,000 years. Our tools of modification now are finer and more precise, that’s pretty much the only difference. You do this so well. Did Notes to Ponder pop over to your blog recently? She’s good value, knows her history, but had a GMO post which made me think of you. Hey, did you ever read this? Interesting, just goes to show that even those on the inside get cold feet. The propaganda surrounding this issue is mind-boggling (probably rivaling religion). Remember, 46% of americans believe in the literal interpretation of Genesis, and only 16% believe in evolution as natural selection by random mutation (the rest are somewhere in between thinking it is theistic evolution). With numbers like that, is it any wonder they are scared of GMOs? If you don’t get evolution, is it any wonder that you don’t get that we are only doing what nature herself does (and did to create us). Before GMOs make headway, evolution needs to make some major strides (but then, even in Europe where acceptance of evolution is much higher, antiGmoism is even worse, so I don’t know what to make of that). Anyway, we’re still only dealing with 1st generation crops because the furore and backlash has stifled many a competitor and increased the burden so much on companies that they have had to scale back new seeds that would even further reduce chemical and pesticide use (though GM seeds still use less of both than organics). I think it’ll be a couple of years yet before we get through this neck of the woods, and then Monsanto really will have to compete. I look forward to that day, though we should have been there a decade ago. Confusion is everywhere… some justified. Did you see the bill that passed the US Senate which excludes Monsanto from any litigation? Behaviour like that sparks attention and concern. There are justified points to be made on GM foods. Very little of those points actually are made, instead activists spend all their time on unjustified points that negatively contribute to humanity. I’m not saying they negatively contribute metaphorically, but literally; read about the golden rice fiasco, and the millions of dead who would have lived if we had given it to them. That golden rice fiasco started with Greenpeace too. Environmentalists are starting to lose it. I hope they course-correct. I consider myself an environmentalist too, but it has now evolved into an ideology and religion. It’s a shame, it did a lot of good in the beginning, then they went on a crusade against nukes and gmo’s. So climate change got worse, and poor people starved and continue to starve. I’m not holding my breath that they will change, though it saddens me that they wont since they think they are acting for the common good. I wholeheartedly agree, but the concerns over cross-pollination are overblown if I must say so. But the reasons for going vertical farm go way beyond this low-probabilistic occurrence. Mainly, as you mentioned, water and land resources, no more pesticides, and decreased growing times (because we have artificially increase carbon exposure on the inside). The sooner we give the farmland back to nature, the better off we’ll all be. Didn’t you hear that the Singaporean VF that opened late last year? Rated 5-10 times as productive as arable land. They are expanding it this year. It is a no-brainer indeed. However, until such a time as that can feed the world, we need to feed it other ways. Sub-saharan africans aren’t going to be grown organic crops anytime soon, they need drought-resistant, heat-tolerant GM crops now so they can grow their own food without further aid money (which usually just makes things worse). I heard something about Singapore but wasn’t sure of its scale. Good on them. The beauty is it’s something we can do so bloody quickly. Literally, 3 years and 6 city blocks worth of 30-storey high farms could be operational. Why isn’t monsanto doing this? Why aren’t governments mandating it? We love Arctic Apples! Their proactive approach is what we need to see more of to sooth fears and foster true transparency on agriculture, science and technology. Exactly, start-ups are always good at responding to what is necessary that big corporations just don’t get. I can’t believe its taken them 17 years and their still not out of the woods yet, that is stifling. If Okanagan Specialty Fruits begins to notice some disturbing health trends possibly related to consumption of Arctic Apples, will they immediately step forward and say so? (Dream on.) In fact, if there are problems with any GM products, won’t the people who are making the money cover up the problems as long as possible? It is the same issue with nuclear power–theoretically it could be ok, but there will always be coverups of anything that slows the cash flow. Human nature and capitalism are not a good mix…not that I have a better cocktail to shake up and serve. I guess you’ve never heard of a food recall? Or any other kind of recall, car recall, vaccine recall etc. It is in the best interests of companies to recall their products and make the next go-round safer so they may stay in business. Nothing stays secret forever, Nixon couldn’t keep his own recordings secret in the late 60s, what makes you think a company like OSF could now in the age of twitter, facebook and Big Data? They can’t, and the backlash against them if it ever came out would send them out of business.